Snowstorms, frigid temperatures, torn up roads, and sluggish fish. That’s the best of what Washington, DC has to offer in late February. It has been a long winter, so the obvious solution was swinging down to Miami to visit my friend from college, Kyle. 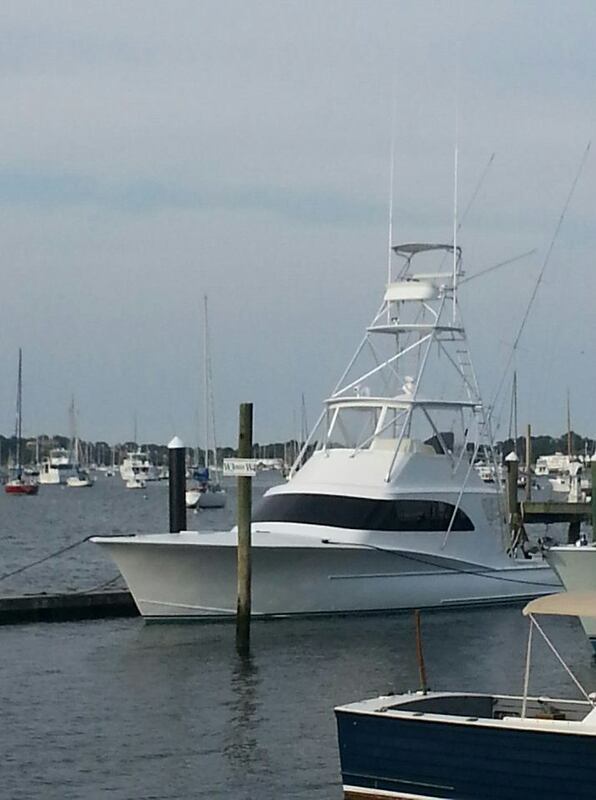 We booked an offshore trip with Captain Bouncer Smith aboard Bouncer’s Dusky 33. I have always heard such great things about Captain Bouncer, I had to get out fishing with him. Our day started off with us running a couple minutes late to pick up some sunscreen. Josh, the mate, greeted us and loaded our lunches onto the boat. Captain Bouncer, told me that my sunscreen would be left behind. It was Banana Boat. No bananas on the boat! I guess that’s what happens why you try to get your supplies minutes before the trip. Luckily the Captain was well stocked up with sunscreen for us to use anyway. We push off and start making our way off the docks. It doesn’t take long to add more excitement, and we haven’t even wet a line yet. We see a thick plume of black smoke up on the harbor. A sailboat was on fire! Captain Bouncer called it in, and we raced over to the scene to observe and ensure everyone was safe. 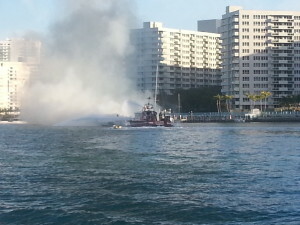 Luckily, no one needed additional assistance and the fire boat was right behind us, and we got to witness the water cannons at work. After a couple minutes of gawking, we went on our way to catch bait. Bouncer got us to the bait marker, showed us the proper way to fish the sabiki, and set us on the first drift. Nothing. Second drift, Kyle pulls up a herring. A couple more drifts, and Kyle pulls in one or two, and I don’t even get so much as a nibble. Captain Bouncer demos it again, and gets nabbed immediately. Kyle pulls up another. Bouncer pulls up a double. Kyle pulls up a double. I pull up nothing. The good-natured ribbing begins. I can’t even catch myself bait – how the heck am I going to catch something worthwhile?! Finally, after about 15 herring and pilchards were in the boat, I got my first one. That didn’t ease the ribbing though. We kept bringing in the bait with Kyle often getting a double and the occasional triple. Finally with the livewell full, we reeled in the lines and headed off to the fishing grounds. Kyle easily doubled my numbers, and didn’t let me forget that. Oh well. I guess that just makes him the Master Baiter. Bouncer brought us a little further south than usual in search of “clean” water – and he sure found it. The beautiful deep blue water looked like something out of a painting. Combine that with the beautiful warm weather and very light seas, and it was a fantastic day on the water. Josh set the baits, and the captain gave us instructions on what to do if and when the lines pop off the wire – count to 4, flip the bail, and start reeling! Not even five minutes in, the boat rolls, and the line comes off the wire. My immediate thought was that it was going to be a long day if the line is simply going to pop off every time the boat rolls. Just to be safe, though, I grabbed the rod, counted to 4, and started reeling. Much to my surprise, the line came tight and went into a deep bend. We were on our first sailfish for after fishing for only a few minutes! The sail took off on a tear and started dancing at the surface. 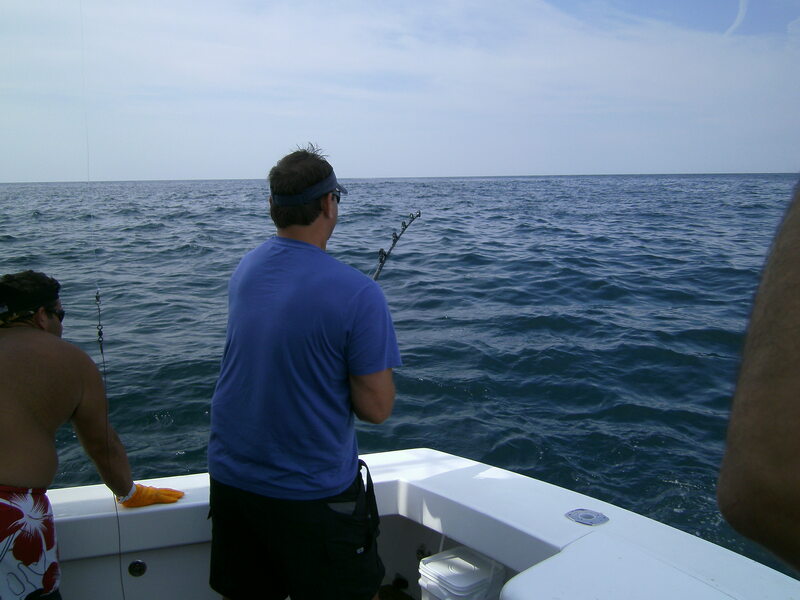 The sailfish put up quite the fight, and Captain Bouncer did a great job controlling the boat, making sure the fish wasn’t running too fast, and making sure I could keep up with the line if it ran at us. After about 10 minutes, I got the fish near the boat. This one wasn’t ready to call it a day though. For another five minutes, we played a game of tug and war. I’d get four feet of line; the sail would take back five. At one point, we got a legal tournament catch, but that wasn’t enough. Captain Bouncer and Josh were committed to actually getting this sailfish to the boat – they knew it was my first sail. You may remember from previous posts that each sailfish I had ever hooked popped off shortly after the battle started. The determination paid off. 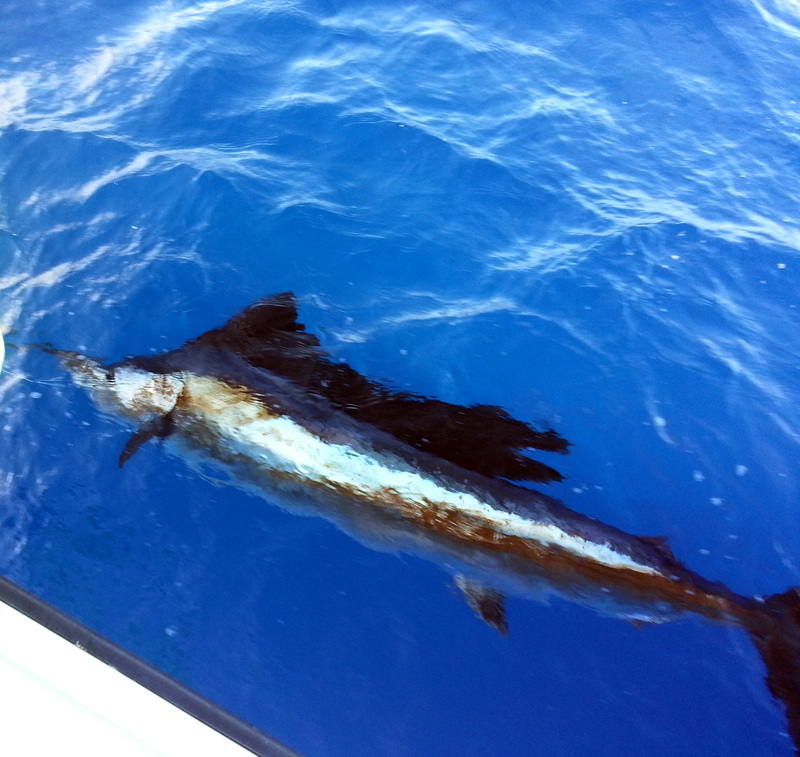 I finally got the sailfish next to the boat, and Josh was able to grab the bill and subdue the fish. We got the cameras ready, and Josh gently lifted the bill out of the water for a photo op. While Bouncer prepped the tag, Josh made sure the fish was fully in the water. Bouncer estimated this sailfish would weight in around 60 pounds – definitely an above average fish. The captain stuck the tag, and we let the fish swim off to fight another day. This would be the biggest fish of the day, but luckily, not the only one. 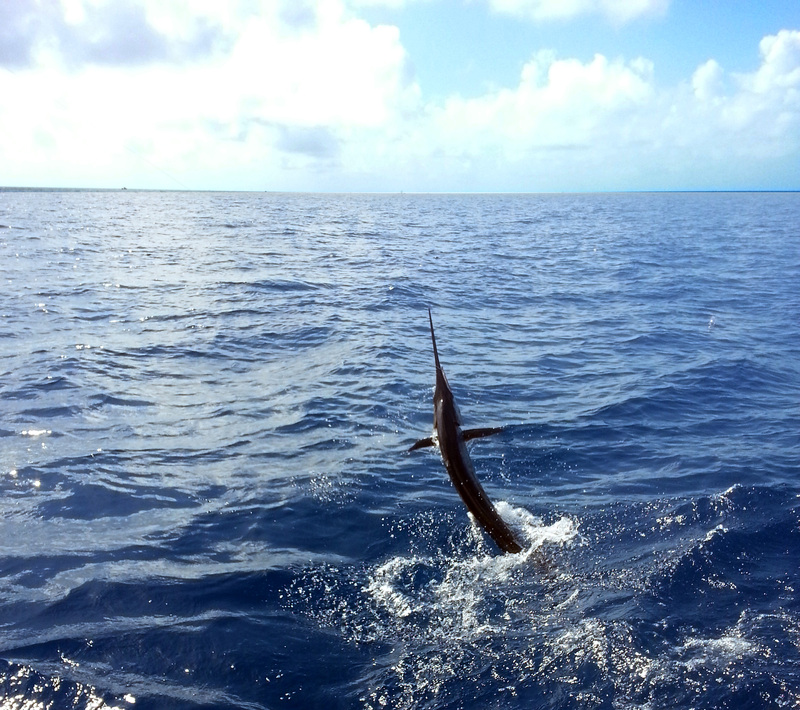 After the excitement of my first sailfish, we set off for more. The day was still early. The baits were reset, and Captain Bouncer and Josh started chatting with us about what we do for work, what kind of fishing we’re into, and making general conversation. We ended up uncovering from Josh – Bouncer was too humble to admit it himself – that Captain Bouncer had just been recognized in the 2014 IGFA Legendary Captain and Crews Awards Ceremony. While we were chatting, Bouncer spotted a free jumping sailfish. Bouncer told Josh to bait a rod and pitch it out towards that direction. Josh hopped into action and stuck a herring with a circle hook. His first attempt at the pitch was thwarted by some rods in the holders behind him. Whoops. Attempt number two was much better. A few seconds after the bait was in the water, the line started peeling off the bail. With the rod now in Kyle’s hand, he flipped the bail, started reeling, and went tight on the free jumper! The fish put on another great acrobatic show, but tired much more quickly. About five minutes later, we had our second sailfish to the boat for another photo session, and Captain Bouncer tagged in before Josh released it. The rest of our day was a bit slower than the beginning – but still a great day. We ended up with three quarters of a blackfin tuna – the rest of it was lost to a shark – and a third sailfish. Through the lulls in the afternoon, Captain Bouncer and Josh kept us entertained with jokes about swollen thumbs and stories of fishing. Listening to radio chatter, Bouncer seemed to always be the one everyone would call to figure out where to find the fish rather than Bouncer needed to call others. 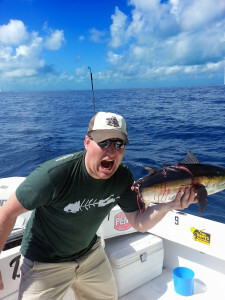 It is pretty clear why Captain Bouncer earned his IGFA distinction. Captain Bouncer fishes year round for anything from tarpon to mahi mahi to snapper to swordfish. Basically, if it is swimming in the seas off South Florida, Captain Bouncer is catching it. Captain Bouncer offers full day and evening/night trips. Ready to book? Captain Bouncer can be reached by email at captbouncer@bellsouth.net. Have you fished with Bouncer before? Leave a review! ***Author’s note: Sometimes I’m having such a good time, I’m not very good about taking pictures. This trip was one of those situations. The only real pictures I snapped were while I was snorkeling. Unfortunately, even those are mediocre at best. I had a very difficult time getting my usually reliable underwater camera/housing to focus on the subjects. Please forgive the lack of pictures, and the low quality of those I did include with this post. I spent the long Labor Day weekend in the Upper Keys with my girlfriend, Susanna – who has made previous appearances in my posts. Our initial trip plan didn’t have fishing in the cards, so you can imagine my surprise and excitement when a week before we were set to leave, Susanna actually ASKED to go fishing. She wanted to do a simple half day and catch some dinner. I started scrambling to find a last minute guide in the Upper Keys that fished for snapper or grouper. I narrowed the choices down and started sending some emails and making calls for availability. Several guides had trips, but I picked Captain Rick Killgore after chatting with him on the phone. Rick was so easy to talk to and loved to share stories about fishing in general. You could tell this was a guy that loved every minute of his job. I booked the half day trip, planning to meeting in the afternoon. Rick had also mentioned he also leads snorkeling, lobstering, and spearfishing trips – even scuba diving if he can get a divemaster to come along. After talking with Susanna and my friend Kyle, who was joining us for the trip, I called Rick back up to change to a full day combo trip. We met up with Rick at the docks in the morning and watched some big tarpon swim under the boat as Rick was putting the final preparations on the boat. Rick pushed off and we made our way to our first stopping point. 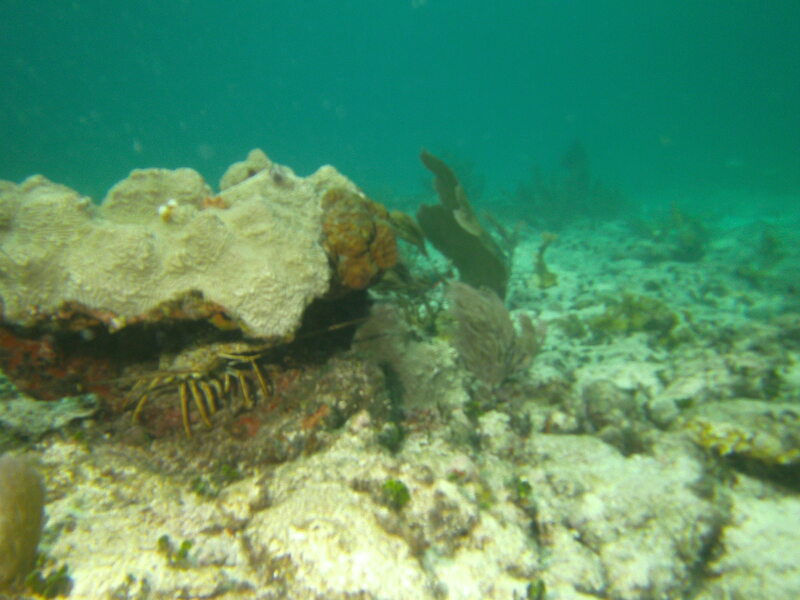 We were starting off the morning with some snorkeling on a shallow reef while we enjoyed the scenery and looked for lobster. 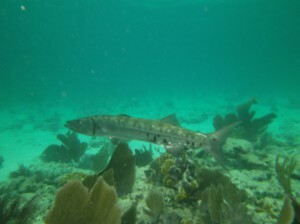 As soon as we jumped in, I was greeted by a barracuda patrolling the reef. He casually looked at us before moving along. Swimming around the sea fans, I finally saw a couple antennae sticking out from beneath a coral head. I dove down to check it out, and sure enough, there was a nice lobster relaxing. I called over Rick who explained what technique we used, then suggested he show me how to catch the first one and he’ll hand everything over for the second. We dove down, and Rick set up the net and used the tickler to coax the lobster out of his hiding spot. As Rick expected, it went speeding out into the net. He was a quarter inch bigger than legal size, so we knew we’d at least have some good eating for dinner! After we got on the boat and out of our snorkel gear, we headed off to a nearby wreck to try to pull up some mutton snapper or grouper. Rick hooked on a live pinfish and dropped the bait. Kyle manned the rod as we drifted across the wreck. We see a tap-tap-tap on the rod, then suddenly it doubles over as Rick tells Kyle to reel. Unfortunately, the line didn’t stay tight. Drop number two, however, had different results. The rod doubled over again, and this time Kyle got tight. A few minutes later, the leader broke the water, and Rick pulled up the fish. It was a shark – not our targeted quarry, but still a fun fish. The next drop, I was on the rod with the same result: another bite, another shark. Even Susanna had the same luck. Rick kept us tight on fish the whole time. In fact, we never even had a drop that didn’t result in a bite. Sharks were king that day though and we probably got eight of them to the boat. I pulled up one very good size bonito that made a very strong run, but nothing that we were planning on eating. All our suspected grouper or snapper bites ended up freeing themselves before we could get them to the gaff. After a little while of fighting the sharks, Rick moved us on to some slow trolling over the reef for some cero mackerel. Almost immediately, one of our baits got nervous. Suddenly, there was a big blow up behind the bait, but the fish missed our hook. Like the sharks, this became a repeated pattern. We’d have the fish blow up on the bait, but would just miss it. Finally, Susanna’s line actually held tight, and she fought the cero mackerel to the boat where it would become dinner in a few hours. We kept on trolling, and Rick told us a few stories about fish he’s caught on the reef. 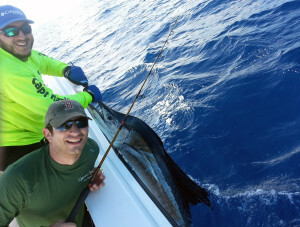 He said it wasn’t uncommon for him to hook into mahi mahi, blackfin tuna, or even sailfish. Less than three minutes after, I see my bait starting to get nervous. Suddenly, I see what looks like a dark triangle behind the bait. As I’m trying to get the words out of my mouth to describe what I’m seeing, Rick yells, “SAILFISH!!!! 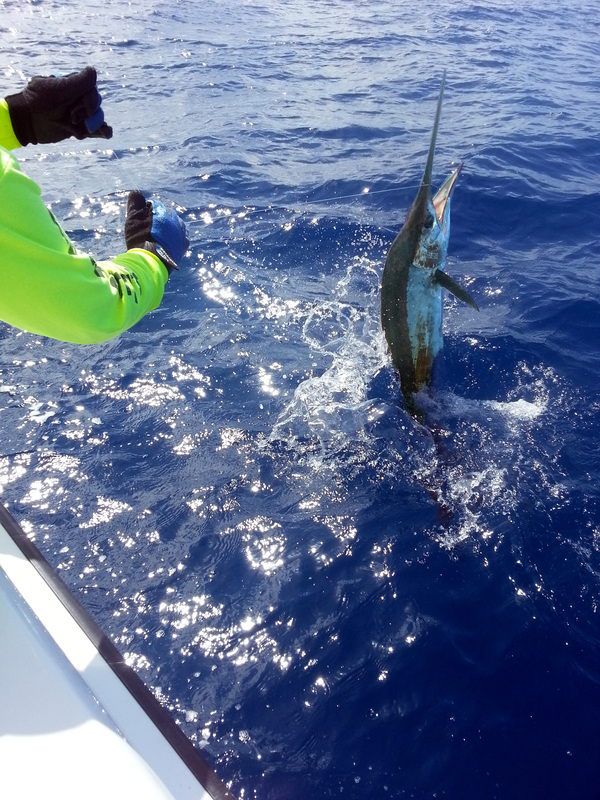 !” Rick jumped in to help feed the bait to the sail, sets the hook, and the line stays tight. He immediately handed over the rod, and I started the battle. A big sailfish (easily 6 feet or more) makes his first appearance above water and goes on a tear in the opposite direction of the boat. The reel is screaming as my smile is growing. The sailfish was clearly unhappy being hooked as it unleashed another beautiful tail walk. 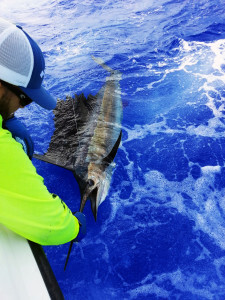 Unfortunately, the sailfish got its wish and threw the hook, but the exhilaration didn’t go away. Rick tried to get us on another fish before the light was gone, but the fish just wouldn’t cooperate. After a good 9 or 10 hours on the water, we headed back to the dock. Rick says he always likes to make sure his clients get at least 8 hours actually on the water. It’s a nice differentiation between other guides that consider a full day 8 hours dock to dock. Rick also doesn’t hesitate to stay on the water for some extra time if you are hot in the action, or in our case where he’s trying to get you that one last fish. We got back to the dock and Rick cleaned and prepped the Cero and the lobsters for us to bring off to get cooked. Ready to book with Captain Rick Killgore? He can be reached at rick@fish-killgore.com via email or by phone at (305) 852-1131. Rick is a versatile captain based out of the Upper Florida Keys (Islamorada) that has both a 23′ Center Console for some reef, wreck, and offshore fishing, as well as a flats skiff for hitting the flats and the backcountry. Rick guides for everything from snapper to bonefish to tarpon to sailfish, and uses either spinning gear or the fly rod. Rick will do everything for you on your trip, or is more than happy to teach you everything you need to know. I’ll be booking Rick again for some flats fishing next time in the Keys. Make sure you leave Rick a review if you get out with him! Last weekend I was invited up to Newport, Rhode Island for a fishing trip aboard Commotion Charters with Captain Dan Tye. 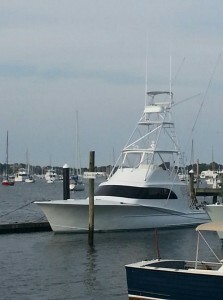 The “Commotion” is a gleaming 50 foot sport fisher. Originally delivered in 2009, this boat looks like it just took it’s maiden voyage yesterday! It sleeps 6, has an air conditioned salon, full bathroom, freshwater maker, refrigerator and freezers. If you’re making a family trip for the day, there is even a TV with Pla ystation. While all the luxuries are great, the outside is what counts the most where you’ll be spending your time fighting the fish. Commotion Charters has all the finest gear, whether you’re targeting bluefish or bluefin. The outriggers gets you more exposure to the fish, while the tuna tower provides a great vantage point for spotting tuna and shark. When you end up reeling in dinner, there’s a large fishhold. Keeping the bait to land that giant is no issue either with the large livewell and bait freezer with an on board icemaker. The twin diesel engines will get you to the fishing grounds fast where you’ll put the gorgeous fighting chair to good use. Don’t want to sit? Commotion’s crew with strap you into the stand up fighting gear. The weather was on our side with plenty of sun and calm seas – not like Commotion has any issue handling rough water. Our initial plan was to make a run to the Canyons, but fishing reports led us to make a game time change in plans to a shark fishing trip. We decided there was no point in spending the time to get all the way out there if the fish weren’t biting. Besides, that just meant I got to sleep in a little later. Commotion Charters provided all the frozen bait we needed, but the captain suggested catching some live bait first. When live “bait” fishing for sharks is 3-5 pound bluefish on light tackle, how can you say no? That in itself makes for a great day of fishing! 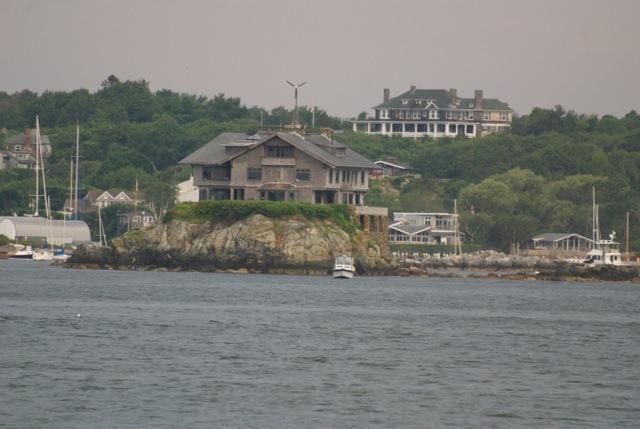 While trolling for blues with the backdrop of Narragansett Bay is great, that wasn’t the intent of our trip. We put our fish in the livewell and got ready for the real fishing. We sped off to the fishing grounds, got our chum slick going and our baits set, began playing the waiting game. 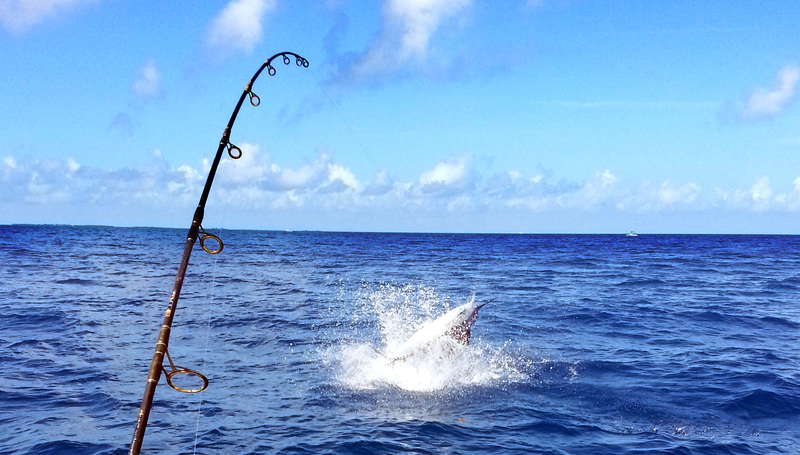 It didn’t take too long before the first balloon dipped hard in the water – the first shark took our bait. 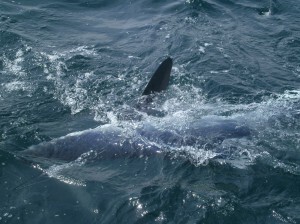 After a nice fight, we had a 7 foot blue shark at the boat, photographed and released. With the baits reset and our heartbeats back to normal, we continued chumming the water trying to attract another shark. We kept a spinning rod baited with a chunk of mackerel and about 10 feet of line off the stern. Our hope was a big shark would take the bait right in front of us. While that didn’t happen, a BIG 20-pound bluefish did take the bait. Unfortunately, I wasn’t paying nearly enough attention and we lost the fish before I could set the hook. Our disappointment didn’t last long as we got hit by another shark. Another battle, another shark at the boat. 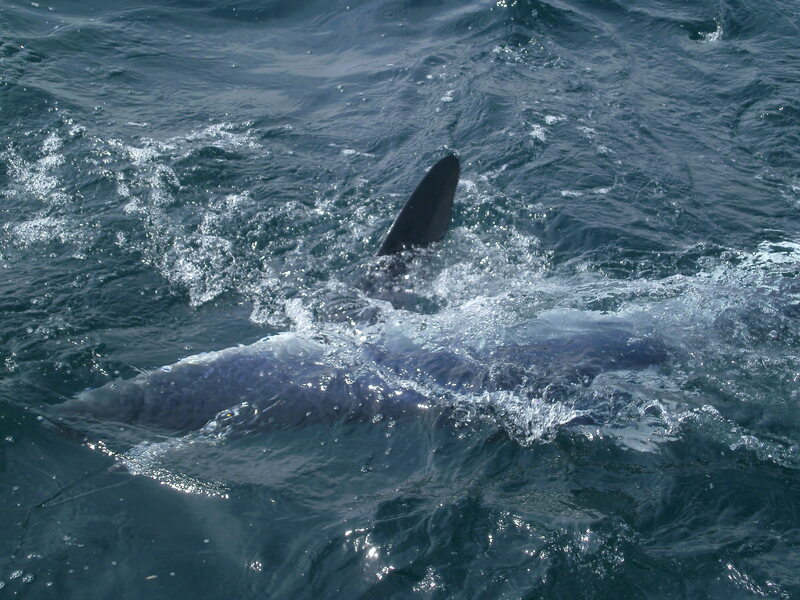 This would be our biggest of the day – a 9 foot blue shark. Unfortunately, with the swivel at the rod tip, the shark made one last ditch effort to get away and snapped the line before we could get any pictures. We brought in one more 7 foot blue shark before calling it a day. I had a great trip with Commotion Charters, and hope I’ll be able to join them on another trip soon! Want to book your own trip aboard Commotion Charters? Contact Captain Dan Tye at (407) 463-9912. Commotion Charters sails out of Hyannis, MA during the summer and fall, and Florida during the winter. 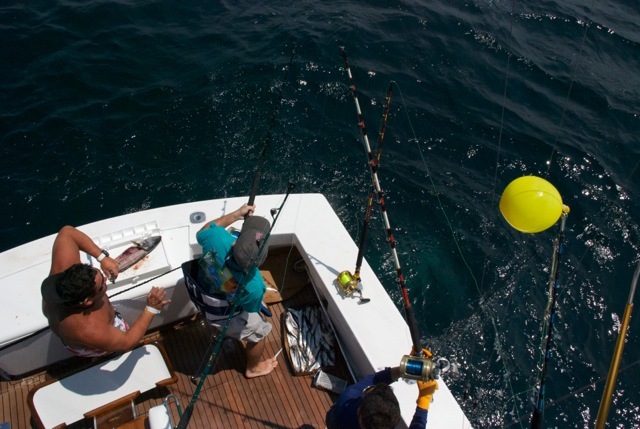 Commotion Charters targets everything from Striped Bass to Bluefin Tuna to Shark to warm-water species in the Canyons.